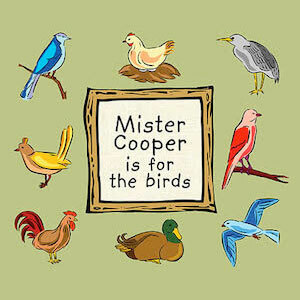 Mister Cooper’s newest CD is upbeat, acoustic roots music filled with lots of original songs that are both educational and fun. The new recording captivates listeners with lyrics about birds (of course), the life of a seed, Matilda (a gorilla), Dr. Seuss, gratitude, and helping the earth survive through conservation. Instrumentation includes guitars, mandolins, banjos, kazoos, basses, a tuba, an accordion, a Steinway piano, pedal steel, as well as some fine harmony singing. The sweet sounds of children’s voices can also be heard from time to time. It’s quality music for the whole family. In total, this is a CD that’s guaranteed to make you smile. If you can’t make it to a library show, or your youngster doesn’t sing with me at school, you can order online by clicking here. You can also listen to samples of all the songs. Please beware of shipping and handling charges. Thanks to CDbaby for making it possible. Digital downloads are also available from iTunes, Rhapsody, and Amazon. 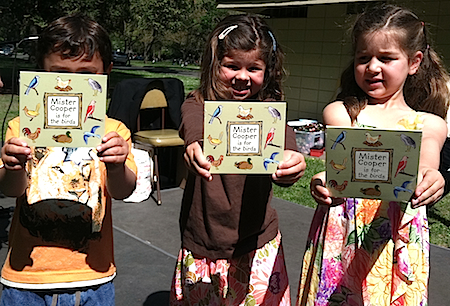 Satisfied customers (Jack, Leila, and Casey) show their new Mister Cooper CD to friends and neighbors at the Great Land Park Spring Egg Hunt. What a great time we had.